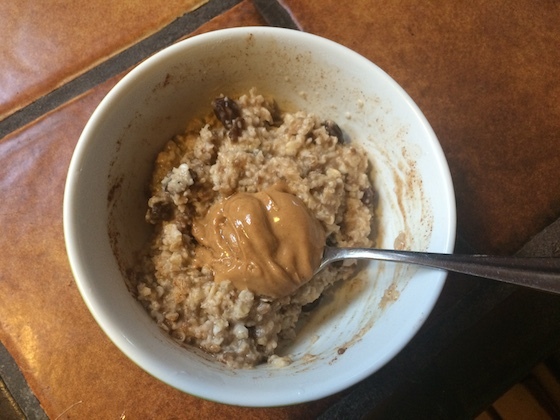 I started yesterday’s meals with my favorite no-fail, fallback breakfast of oats with raisins and peanut butter. This warm and comforting bowl nourishes me without leaving me too full. After feeling a bit off the day before, I knew this would be a good choice to help re-set my system. I think it’s super important to have a couple of gentle, easy-to-digest dishes that you can depend on to satisfy you; mine include oats, scrambled eggs, and buttered toast. My day was super busy working on a project with one of my team members – our deadline is Friday! 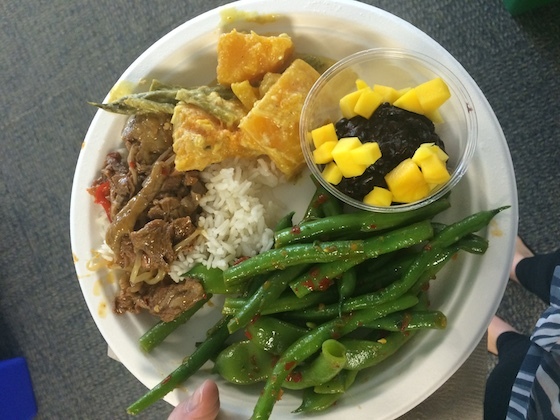 lunch came before I knew it: Thai curry with butternut squash and a little beef, steamed rice, lotsa green beans, and a little sticky rice with mango for dessert. I consciously took a bit of a smaller portion, because even though it looked delicious I wasn’t particularly in the mood for a big plate. This serving was perfectly yummy and satisfying. 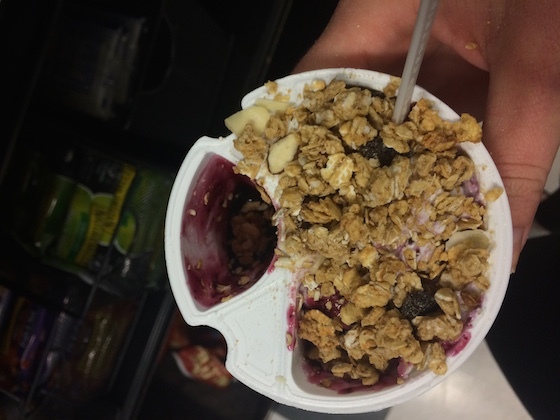 I did get hungry mid-afternoon, however, so I grabbed some blueberry Greek yogurt for a snack. I sprinkled just a small amount of granola on top. This filled me up surprisingly well, as yogurt usually does for me, I’ve found. My mom was in town for work, so she and I met up for dinner. We went to an Italian restaurant that she likes, but I’d never tried. We sat at the bar – it was so fun! Our meal began with sautéed broccoli rabe, for some good green veggies. 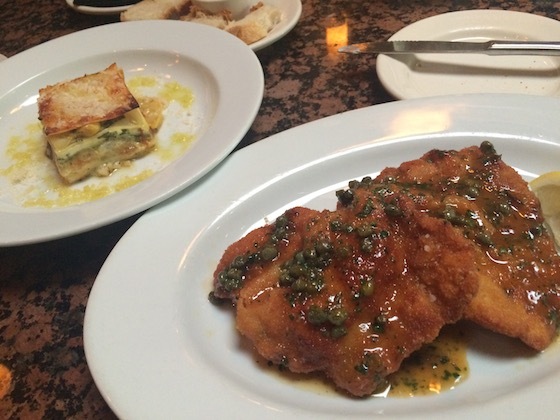 Then, we shared a delicious pork milanese and summer squash lasagna. Both were incredibly well-prepared. Look at the crust on that pork – it was so crisp and flavorful! I love to share – you get the chance to try a couple of dishes, and I find that it can often be unsatisfying to eat too much of a single dish. With sharing, I never get bored. Of course, we had to end the night with dessert. 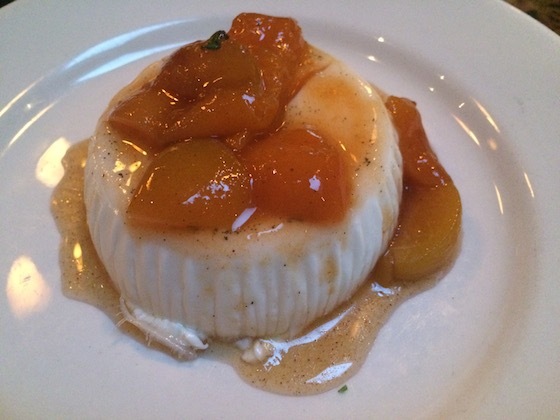 My mom let me choose, so I went for this panna cotta with stewed apricots and star anise. The pudding was incredibly smooth, infused with sweet, floral vanilla – heaven. The star anise added a unique and unexpected note. My mom reminded me of the first time we both tried panna cotta. It was together in Italy, when I was only four. It’s been a favorite of mine ever since, just as I love sharing delicious Italian meals with my family. I am renowned for “never sharing” food. All my friends and family know I don’t share easily. I think it must date back to feelings of not having enough to eat, in a large family of fast, hardy eaters, some of whom always seemed to reach for seconds before I had my chance. After reading this post, I have challenged myself to share an entire meal when dining out with someone, at my earliest opportunity. This won’t be easy for me, but you make it sound fun! And the smaller portions plus greater variety would be good for my current food program, aimed at losing some of the pounds that have accumulated, post-menopause.